Configurable for trailer- and truck-mounting, Gen III A/W Series allows teams working on road and rail construction to safely handle water and pressurized air. Reels are manufactured from impact- and corrosion-resistant polypropylene to withstand tough industry demands. Available in range of hose lengths up to 20 m, and hose IDs from 8–12 mm, AW Series is suitable for up to 240 psi working pressure at 30Â°C. Reels ensure hoses are organized and coiled neatly, minimizing trip hazards. ReCoila’s Gen III Air/Water series (AW Series) reels can be configured for trailer-mounting and truck-mounting to allow teams working on road construction and rail construction to safely and more efficiently handle water and pressurized air. By keeping water and air hoses on long lasting reels, hoses are always organised and off the ground, thus reducing potential trip hazards on site. These units are manufactured from impact- and corrosion-resistant polypropylene; the ReCoila AW Series is tough, reliable and made from the highest quality components to withstand tough industry demands and heavy duty cycles. Another advantage of using ReCoila’s AW Series in such applications is if ever there is a need for urgent follow up service or parts, ReCoila is Australia-based and has immediate parts and service availability. Imported alternatives could lie dormant for weeks if equipment is solely reliant on foreign proprietary parts. ReCoila’s Gen III AW Series is available in a range of hose lengths up to 20 metres, and hose ID from 8mm to 12mm. The AW series is suitable for up to 240 PSI working pressure at 30°C. Other advantages of installing a ReCoila reel include increased safety as the hose is coiled neatly ready for use, not lying on the floor creating a trip hazard. The AW Series reel is also suitable for compressed air, and models are available with special purpose EPDM rubber hose for applications where welding spatter adversely affects standard hoses. 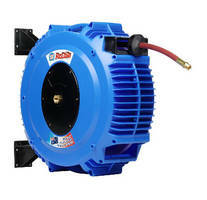 ReCoila also design and manufacture custom hose reels for individual client requirements.